Concerning the protection of this row of shops the requirement was that the barrier should not hinder shoppers with shopping trolleys, prams, wheel chairs or walking frames when the barrier is not in use. Our newly developed BLOBEL floor sealing system makes it possible. The flat, slightly rounded threshold/ground plate can be driven over and walked over without the risk of tripping. 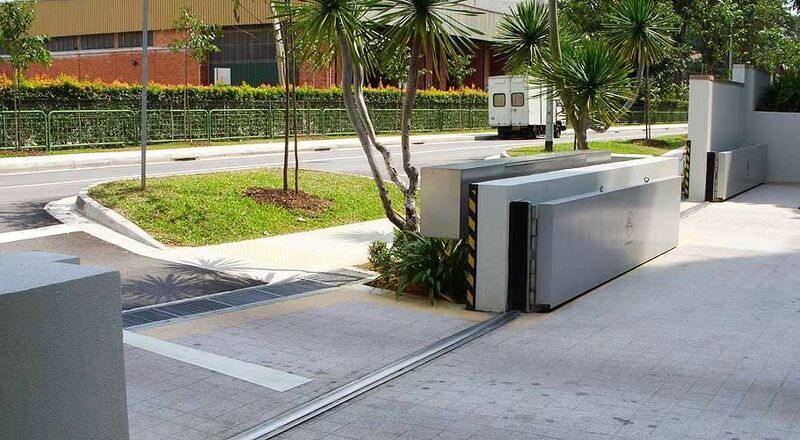 The special sealing technology at the barrier adapts well to this threshold/ground plate. 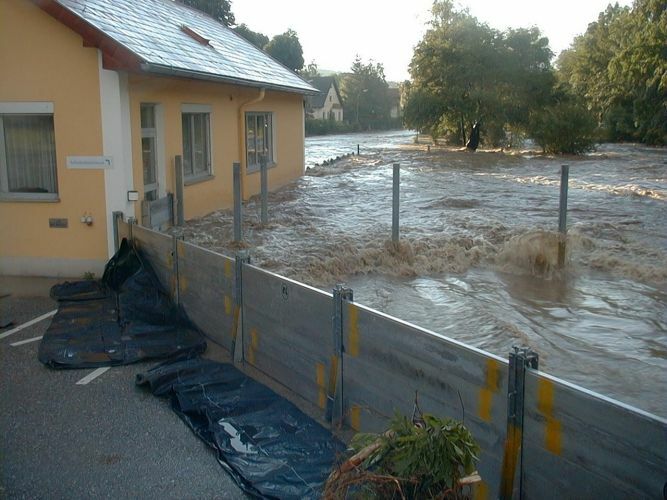 Because the barrier is divided into individual sections a passage can be left open during a flood water warning until the water really comes. BLOBEL secured the complete company premises, which are located directly at the bank of the river Triesting, with demountable HW retention walls. 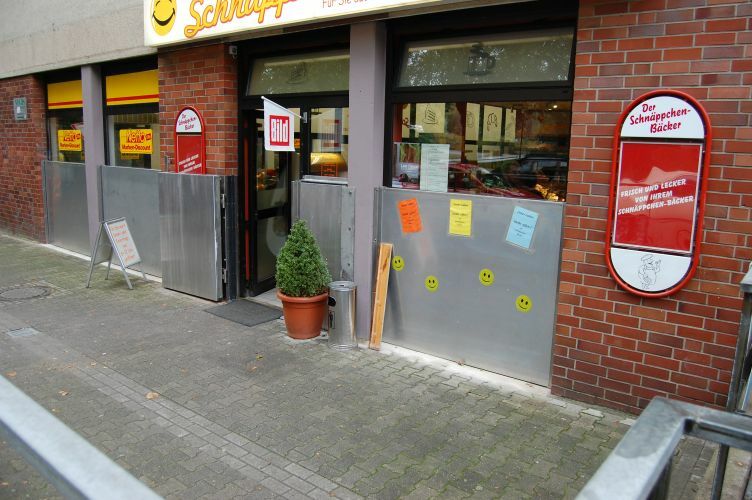 Additional barrier plates for windows also protect the building from flooding. The HAP SB system is particularly robust and can be fitted quickly by the company's fire brigade. If you store, fill, sell, produce, treat or use water-contaminating substances, you have to fulfil the conditions of the water balance regulation in order to protect people and the environment. This also applies for this logistics and warehouse company at the river Rhine. If necessary the fully automatic BLOBEL barrier systems reliably close whole sections of the warehouse within the building complex and safely retain possibly contaminated sprinkler water. BLOBEL secured the complete company premises, which are located directly at the bank of the river Triesting, with demountable HW retention walls. Additional barrier plates for windows also protect the building from flooding. The HAP SB system is particularly robust and can be fitted quickly by the company`s fire brigade. 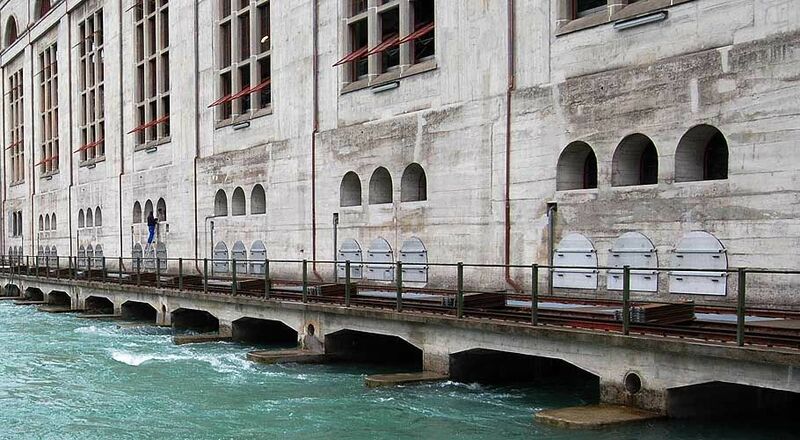 As a listed building that has been in operation for the past 100 years or so, the Mühleberg hydroelectric power station's electrical and turbine installations needed to be partitioned off. BLOBEL's window and retention barriers were adapted to meet the requirements of this historic building and to comply with regulations governing the preservation of monuments. 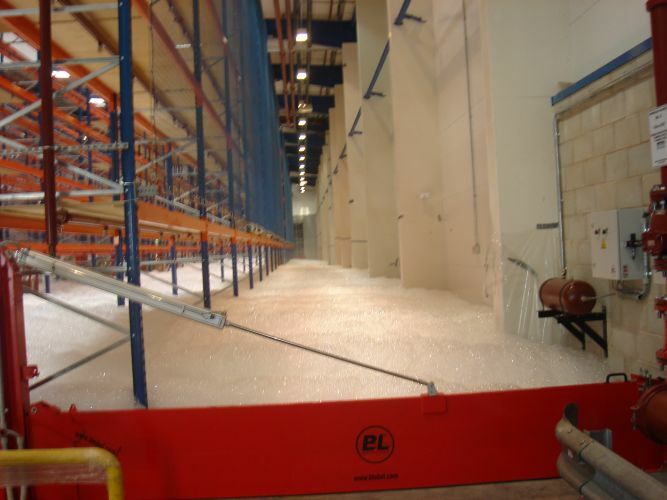 L'Oréal operates a foam extinguishing process in its warehouses world-wide which it developed itself. 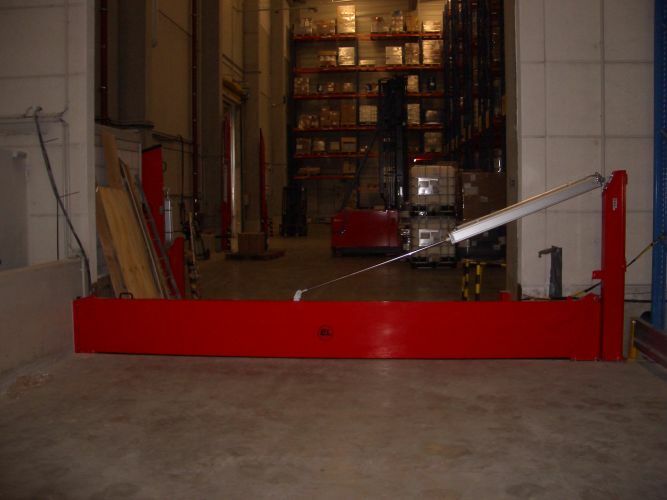 In order to minimize the risks for staff during a fully-automatic closure of the warehouse entrances, the BLOBEL facility switches to a pressure-reduced safety circuit when it is activated and closes with a reduced pressure of 43.5–72.5 psi (3–5 bar). The restaurant complex with bar, café und bistro is a popular destination because of its spectacular location at the coast four hours drive from Sydney. 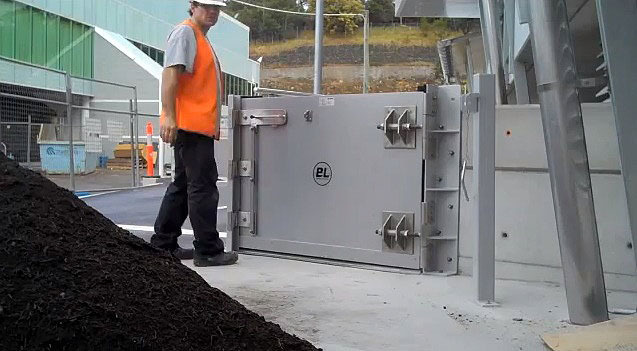 As New South Wales does not allow any manually stackable systems one faces the danger of flooding with BLOBEL barriers which have an easy-to-use door system. It was the flooding in July 2010 that tipped the scales. After residents in the 400-unit Tessarina condominium found their vehicles in the basement car park almost submerged in water, the decision was taken to prevent future floods from causing similar damage. 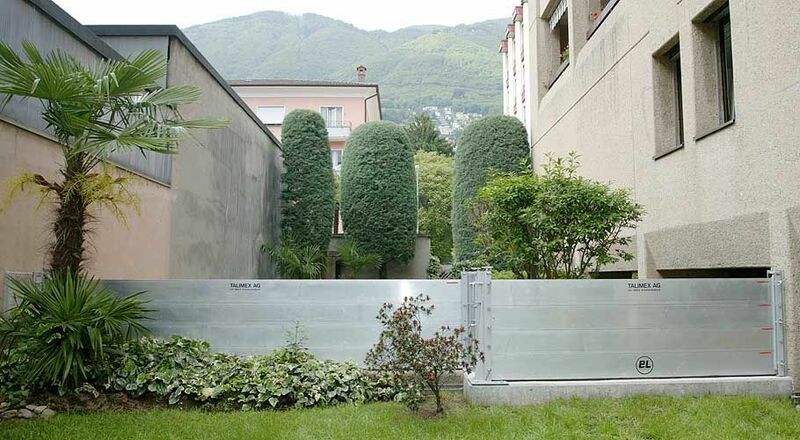 Altogether, there are six BLOBEL barriers (2 BL/HHS, 3 BL/HDS, 1 HTL-SB-Vario) now protecting the various building openings within the apartment complex, which lies at the foot of a sloping road, from further torrents of water. The barriers are activated via a video surveillance system operated by the complex's own security staff.